From Hwy 1 take the 542/Cassils Rd exit into Brooks (Shell Station). Head East on Cassils Road. Turn Left (south) on 7th Street East. South on 7th Street, cross railroad tracks, turn right (west) onto Industrial Road East. First right (north) follow road past PetroCanada Cardlock. Continue to Absolute Safety building. 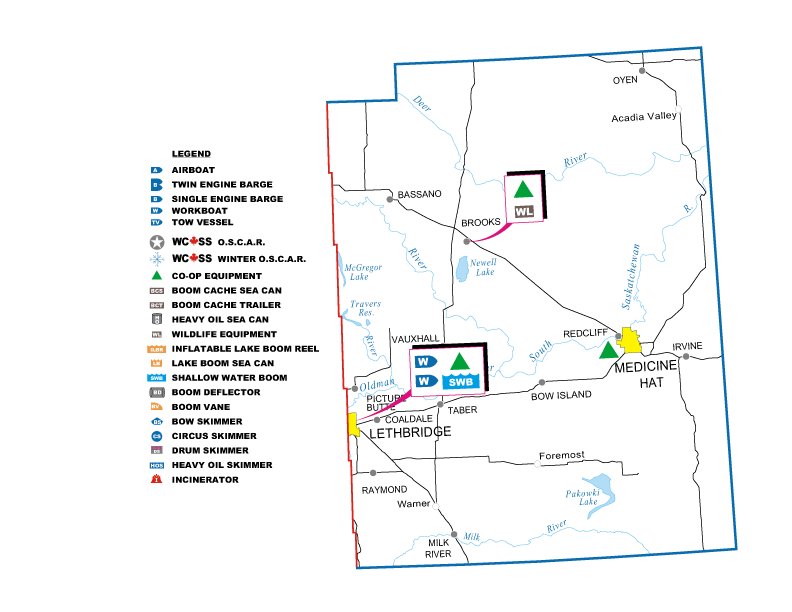 Enerplus Site, east of Redcliff on Highway #1. Exit off Hwy 1 onto Brier Park off-ramp. Follow Box Springs Road north to 23rd Street NW. Turn right (east) onto 23rd Street. Go east to Division Avenue. Turn north on Division Avenue (gravel road) for 1 km to dead end. Turn right (east) for 1 km. Enerplus fenced yard is on the south side of the road. Note: Locked gate; must phone for access.